Since moving to Montana, I’ve come to the general conclusion that academics are like wolverines (well, at least academics in my fields): we like our space. We really, really like our space. One might say we’re ridiculously, fiercely protective of that & may in fact get pretty damn grumpy when we don’t get it. I’m currently knee-deep in a week that is making me want to crawl under a blanket and not come out – in the midst of a month that’s doing the same – mostly because my calendar app looks like someone else’s calendar got imported on top of mine. It’s forcing me to be really productive, which I appreciate (I’ve gotten TONS done in the past couple of days! ), but I’m also realizing how loosey-goosey my week must look to a person on the usual 9-5. Jeff Wasserstrom (UC Irvine) was kind enough to think of me (well, more accurately, the Star Wars lianhuanhua) when the world was abuzz with speculation on the latest Star Wars premiere in China. While it’s a little weird to have a random purchase be my calling card since 2014, I’ve just gone with it – Jeff interviewed me for the Los Angeles Review of Books China blog, in the hilariously titled “Darth Vader and the Triceratops,” which came out a few days before my birthday (nice little birthday present, a new line on the ‘Press Appearance’ section of the CV. Thanks, Jeff!). There was also an amazing article in the Japan Times that a fellow UCSD Modern Chinese history-er pointed me towards, on the artist behind the lianhuanhua! Entitled “Red ‘Star Wars’: How China used pirate comic to promote science in 1980s,” I was a little sad to see no mention of a little post that went viral, but still – cool to discover more history about this thing that I will apparently be dealing with forever. Shortly after that came out, my first academic article in eons came out – relating to stuff I’ve already yammered about a lot here in a much more casual format. “The Game People Played: Mahjong in Modern Chinese Society and Culture” is available at Cross-Currents (open access!). A quick plug: the Cross-Currents editorial staff were models of efficiency & great to work with, and the whole process was really pleasant. It’s not necessarily the article I dreamed of publishing, but for something that was mostly a hacked back version of a 3rd year grad school research project, I did OK. Thanks to Amanda Shuman, Chris Bateman, and Reed Knappe for a lot of good feedback while I was getting it ready for publication. And of course, that seminar from oh-so-many-years-ago – it makes me a little misty eyed remembering it! I did want to include a couple of images I couldn’t in the article – paired below with the relevant portions of the article. 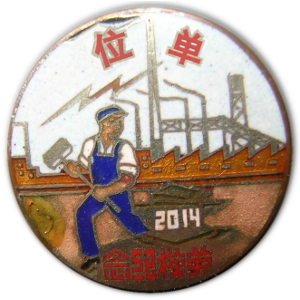 The association between mahjong and baser social elements was not confined to Chinese observers alone. 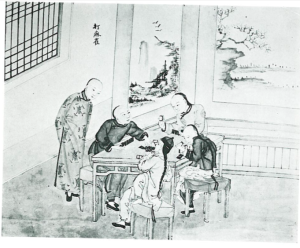 In 1925, the Japanese professor Aoki Masaru commissioned a series of paintings—later published as Pekin fuzoku zufu [Illustrations of Beijing customs]—depicting many aspects of life in Beijing. 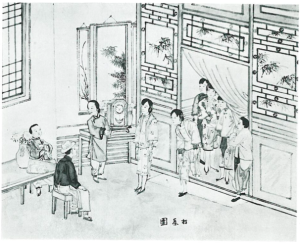 One series of three images illustrates some pleasurable (and morally suspect) pastimes: sandwiched between two well-dressed gentlemen inspecting beauties spilling out from behind a curtain in a “tea house” and opium smokers lounging while puffing on their pipes is a lively game of mahjong (Aoki 1964, unnumbered plate). It doesn’t seem accidental that mahjong is slotted alongside a teahouse of ill repute and opium. And yet, by the twentieth century, mahjong not only was attracting players from the upper echelons of Chinese society, but had fans in Japan and the West, as well. 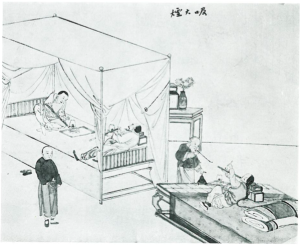 Despite being a trifling matter, mahjong was a concern for reformers because it cut across class, gender, and geographical boundaries. At the same time, some writers recognized that mahjong was merely a symptom, not the cause, of problems faced by urban residents, particularly women. In a compelling Women’s Voice article from 1947, the reader is drawn to a cartoon labeled “Still Comrades” (“Naiyi” 1947, 18). 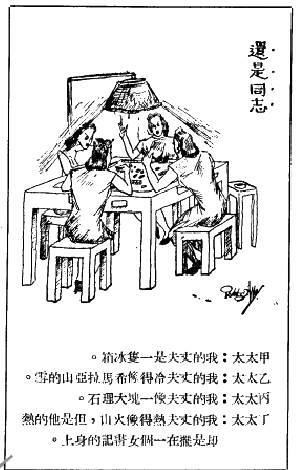 Four women hunker down over a mahjong game, complaining about their husbands. “My husband’s a refrigerator,” one says. “My husband is as cold as the snow of the Himalayas,” grouses another, while the next states that her husband is like a block of marble. “My husband is hot as a volcano,” declares the last, “but he only uses his heat on the body of his secretary.” Mahjong is simply a facilitator for the conversation happening at the table, and it is this social quality that the article takes up in discussing mahjong clubs.